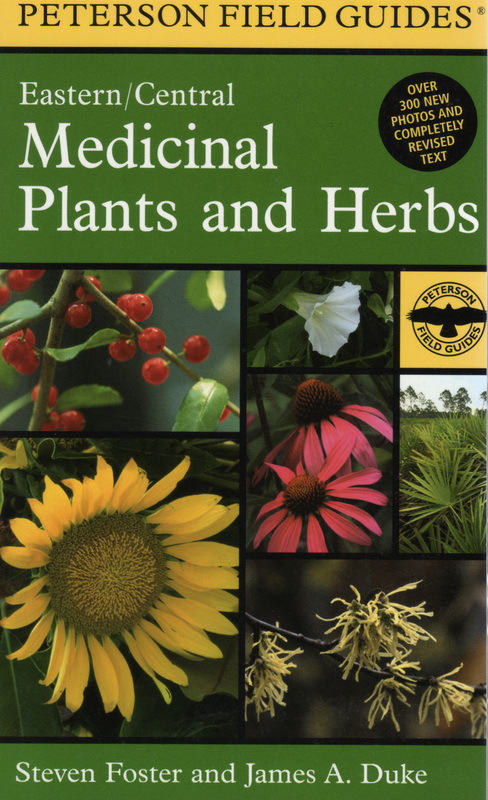 The all new third edition of a Peterson Field Guide to Medicinal Plants and Herbs: Eastern and Central North America. Roger Tory Peterson (1919-1996) wrote and illustrated A Field Guide to Birds: Eastern and Central North America, now in its 6th edition, first published in 1934. He invented the modern 20th century concept of field guides, introducing generations of Americans to the flora, fauna and natural features of North America. Peterson Field Guides have now been for published 80 years. The third edition of the Foster and Duke Field Guide to Medicinal Plants is expanded to include 60 new species not found in previous editions. The book includes 531 species accounts with information on 588 medicinal plant species. With 705 color photographs by Steven Foster, over 88% of the images are new. Over 66% of the plants in the book are native species, while 33% represent non-native, mostly European and Asian aliens. Whether hiking along a remote Appalachian mountain trail or simply observing plants in one’s own yard, medicinal plants can be found everywhere humans live and travel. Can we control invasive alien weeds by finding a use for them? Many homeowners attempt to eliminate weeds from their yards—dandelions, English plantain, and chickweed. Some call them weeds. We call them medicinal plants. Some garden plants, such as English Ivy, are registered as ethical drugs in Europe, in this case for the treatment of coughs and upper respiratory tract infections. A Field Guide to Medicinal Plants and Herbs provides a glimpse of the human experience with plants. Native medicinal plants from the eastern deciduous forest, including black cohosh, goldenseal, and American ginseng are among more than 150 native species that are still harvested from the wild and enter international commerce. Sustainable use of these valuable resources is paramount for future generations. Conservation of these important genetic resources is informed by awareness of their medicinal value. Uses have been thoroughly updated and revised, with more nuanced detail on historical use in pre-21st century America and elsewhere, including ethnobotanical details by specific native American groups, traditional use by American physicians and herbalists, and information on historic or modern use in Europe, China, and elsewhere. Details on the latest scientific developments that in many cases reveal a rational scientific basis for traditional use. Rather than use the internet or secondary references, the authors went to great lengths to scour the original references from which the information is derived, whether a 17th century renaissance herbal or the latest original scientific studies. Since the publication of the second edition in 2000, worldwide research on medicinal plants has increased by a factor of at least 5-fold. 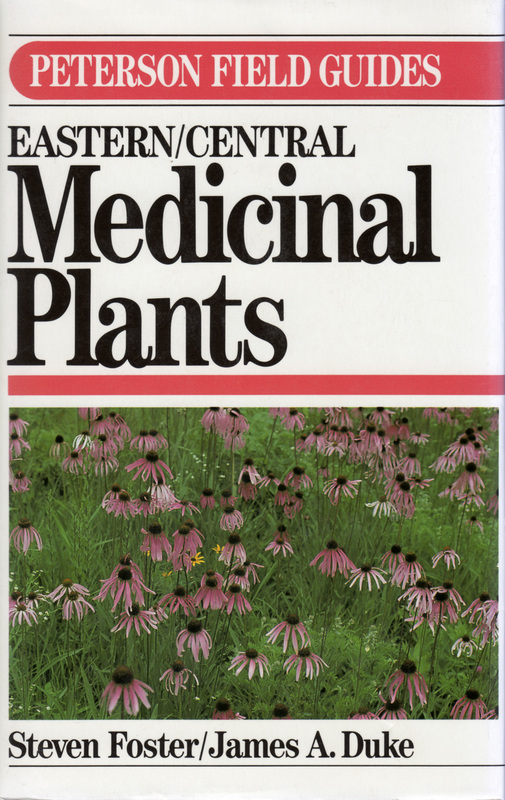 Prior to the year 2000 a PubMED search for Echinacea in the title of a scientific paper returns 80 unique studies. A search for Echinacea in the title between 2000-2013 yields 443 studies. The last decade produced a dramatic increase in the study of plant genetics leading to changes in plant taxonomy and family associations. New taxonomic designations are provided along with the synonyms of familiar scientific names from earlier works. Plant biology and plant geography is dynamic, not static. We have revised and updated geographical distribution and occurrence details. Many non-native species have greatly increased in distribution, a disturbing but important data set. A surprising aspect of revising data was the need to readjust the range of blooming periods. With the effects of climate change, some plants are blooming earlier (or in some cases later), which may reduce or extend flowering or fruiting, depending upon species and distribution range. The book contains appropriate warnings on those plants that can lead to poisoning or toxic reactions, sometimes even by handling the plant. Some plants, such as St. John’s wort are known to interact with enzyme systems that interfere with the absorption of prescription drugs, sometimes increasing or decreasing the drug’s effective dose. Important examples such as St. John’s wort are update to reflect that new research. Cover of the 1st edition published in 1990. First published in 1990 Steven Foster and Jim Duke’s A Field Guide to Medicinal Plants: Eastern and Central North America (Softcover: ISBN 0-395-46722-5) featured information on the identification and use of about 500 medicinal plants of eastern and central North America. It was the first modern comprehensive field guide to medicinal plants. The book included pen and inks by Roger Tory Peterson, Lee Peterson and Jim Blackfeather Rose. A 48-page color insert had nearly 200 photographs. With 366 pages it was the 40th title in The Peterson Field Guide® Series. If you have the first edition, you don’t have the third edition. Simple as that. Cover of the 2nd edition published in 2000. 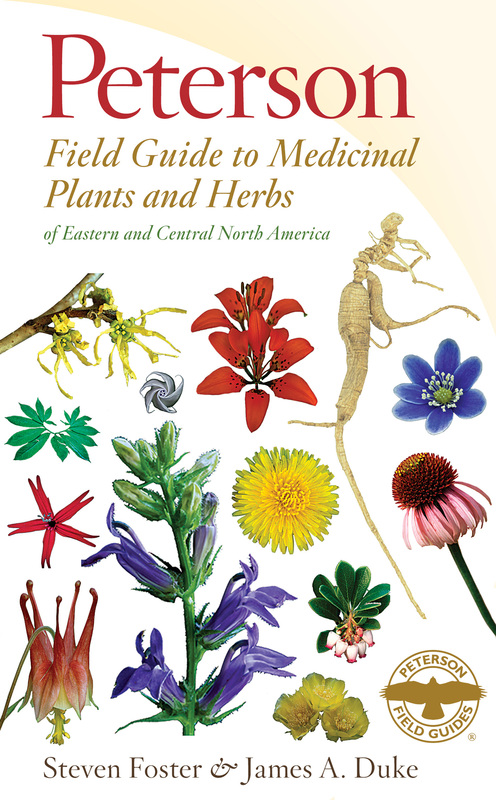 In 2000 we produced a new edition of the title, this time calling it A Field Guide to Medicinal Plants and Herbs: Eastern and Central North America, with no line drawings, illustrated with photographs. Herbs had come of age by the year 2000. In 1990, annual herb product sales were about $250 million, and by 1990 they had surpassed $3 billion largely the result of the dietary health and supplement act on 1994, which created the regulatory category of “dietary supplements” and moved herb products from health and natural food stores into the mass market. A few years earlier, the infant internet also began to play a role in marketing and distribution. If you have the second edition, we think you will enjoy the all new third edition. Jim Duke at Herbal Vineyard, 2013. Helen Lowe Metzman photo. We were on a flight from Miami to the humid, heat-laden air of the ancient rainforest city of Iquitos, Peru. You may remember the main character in the 1993 new age mystery novel The Celestine Prophecy “driving” to Iquitos. The fact is, there’s only two ways to get there — by air or via the Amazon River. There are no roads to Iquitos. “capital of the Amazon.” I was traveling to the Amazon for the first time with the American Botanical Council’s “Pharmacy from the Rainforest” program in the fall of 1995. Since our group numbered over 100 people, the instructors got bumped-up to first class. I sat next to Jim Duke, who had made the trip too many times to count (up to ten times a year). It was my first trip to the real tropics, besides a short stint in Guatemala during the dry season. The flight was rough. The flight attendants plied us with drinks, and our conversation lasted the length of the flight. Duke treated me like he was leading a kid to a candy store. After a night in Iquitos, the 120+ participants loaded into boats and went down the Amazon River to Explorama Lodge, a rustic, but comfortable facility featuring all the creature comforts a rainforest camp can offer (with emphasis on “creature” as a tarantula-sized spider crawled across my room). “You get it out,” I told my roommate Larry Wilson, the herpetologist on the trip. You’re the animal guy. I’m just a plant guy.” He grudgingly obliged. Explorama Lodge served as the main camp for the trip. Two other locales were featured, Napo Camp, and ACEER Camp, up a major Amazon tributary—the Napo River. 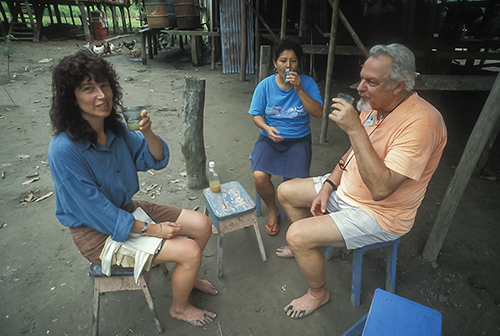 Amanda McQuade and Jim Duke enjoying rum and ginger juice along the Amazon. Dr. Duke was the perfect host. One afternoon he took herbalist Amanda McQuade and me to visit a friend of his who lived on the Amazon’s banks. The farmer grew sugar cane, which he turned into a sickly sweet version of white lightening in a battered old copper still. “Rum”, Jim called it. The farmer’s wife made drinks for us — half fresh-squeezed ginger juice and half “rum”. It sure took the cares away, and cured the tourista, too. Why, if an Anaconda had swam by in the nearby rushing waters of the Amazon, I might have just hopped on its back and taken a ride to our next day’s venue — ACEER. ACEER— the Amazon Center for Environmental Education and Research— was a couple hours away by boat (followed by a 30-minute hike through the primary rainforest. ACEER is Jim Duke’s home away from home, now that he is “retired”. At ACEER, Jim Duke, along his local shaman colleague, Don Antonio, freely share knowledge on the ethnobotany of Amazonia. Duke’s infectious love of the Amazon, its people and flora inspire all who travel there, as he tromps barefoot through the jungle, seemingly oblivious to the ants, swarms of insects, and occasional reptile that might lurk beneath the understory. For those who know Jim Duke from North American venues such as scientific conferences, herb gatherings, or a North Carolina bluegrass stage, you know that his is really at home — where his heart is — when you see him in the primary rainforest of the Amazon. Duke was right about his prediction. I did get the tropical bug. Since traveling to the Amazon with him, I am committed to taking a trip to a tropical location at least once a year. I thank him for that. I met Jim Duke in the autumn of 1978 long before his fame had traveled from the halls of relative academic obscurity to herbal celebrity. We met in the backyard of Paul Lee PhD who had been unceremoniously dismissed from a teaching position at Harvard (along with Timothy Leary and Richard Alpert aka Ram Dass) after publication in the Harvard Crimson of an exposé on LSD experimentation co-authored by an undergraduate student later to become guru of alternative medicine—Andrew Weil, M.D. Jim had just walked to Paul’s house from his hotel, with notebook in hand, documenting varieties of opium poppies (Papaver somniferum) which grew as ornamentals in people’s yards. At the time I was 21 years old. I had just left the Sabbathday Lake Maine Shaker Community where I had been for four years. Having grown up in Maine, that trip to California, was my first trip west — west of New York City. Here, I was meeting some of the giants of medicinal plant research for the first time. We were attending an international herb symposium at U.C. Santa Cruz organized by Paul Lee. First impressions are everything. I didn’t even know how to start a conversation with someone of the stature of Jim Duke. He was one of the few medicinal plants researchers at the time, and certainly the only scientist in the Federal government researching herbal medicines (at least clandestinely if not officially). At the time he was Chief of USDA’s Economic Botany Laboratory in the Agricultural Research Service in Beltsville, Maryland. Humility rarely follows success. Duke, as he refers to himself, turned out to be a Southern gentleman first, a famous scientist second. His interest in poppies grew out of his second stint with USDA starting in 1971, which took him to Iran to study species diversity in opium poppies as part of his professional role in researching crop diversification and medicinal plants in developing counties. His passion for how humans use plants as medicine, rolled from his tongue like a kid licking a lollypop. At once, he put me at ease. Here was a man who was more interested in what I might have to say to him than in what he might have to say to me. He stood next to a Mullein plant in Paul Lee’s garden. I snapped a photograph as Jim Duke recited a poem. The photo of him I took that day along with the poem on mullein, are in one of Duke’s more obscure of over thirty books, Herbalbum-An Anthology of Varicose Verse, published in a staple-bound photocopied edition in 1985 — a collection of over 400 herbal poems and a couple dozen songs set to bluegrass melodies. In case you are wondering how the syllables breakout for pronunciation, that’s “herbal-bum” for the poems. The songs were released under the same Herbalbum title, but in this case pronounced “herb-album”— a vinyl record of bluegrass songs written and performed by Jim Duke and his bluegrass buddies (later released on tape and CD). 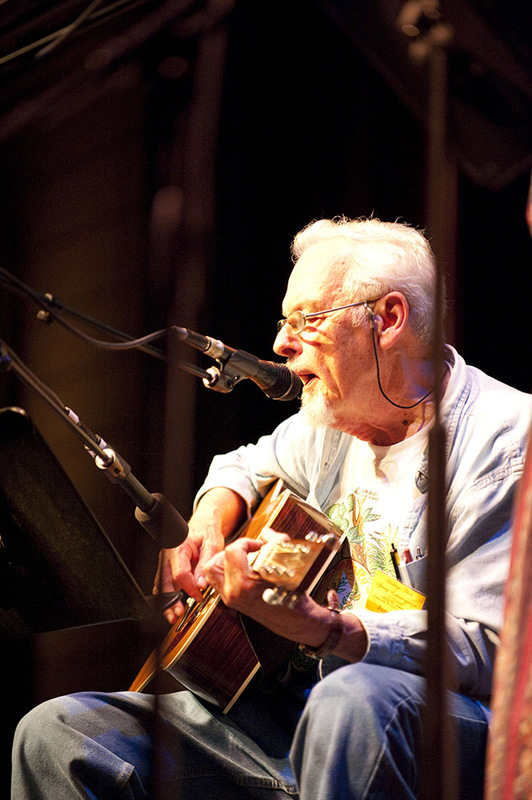 Jim Duke performing at the Ozark Folk Center in May of 2009. Early in Duke’s career with Missouri Botanical Garden his work took him to Panama where he penned painstaking technical descriptions of plants in eleven plants families for the Flora of Panama project, published in the Annals of the Missouri Botanical Garden. During his years in Panama he also studied the ethnobotany of the Choco and Cuna native groups. The Choco are a forest people who lived scattered along rivers. The Cuna live in villages. Another fruit of these years was his first book — Isthmanian Ethnobotanical Dictionary, a 96-page handbook describing medicinal plants of the Central American isthmus. In 1963, Jim Duke took a position with the USDA in Beltsville, Maryland, focusing on tropical ecology, especially seedling ecology. From 1965 to 1971, he worked on ecological and ethnological research in Panama and Colombia for Battelle Columbus Laboratories. Jim Duke doesn’t talk much about this work. However, if you put some of the pieces of the puzzle together, his more obscure scientific publications of this era reveal the focus research. Many of his publications were prepared for his employer on behalf of the former Atomic Energy Commission. The work was akin to environmental impact statements on the effects of radiation on tropical organisms. President Kennedy had an idea. He initiated a feasibility study to widen the Panama Canal, or perhaps excavate a new canal to accommodate supertankers. The project was called the Atlantic-Pacific Interoceanic Canal. America had a tool that would easily accomplish the excavation work —nuclear devices— nuke the Central American isthmus to create a new canal from the Atlantic to the Pacific! Duke’s studies may have helped to show that the excavation technique may not be such a good idea. After that stint, Duke returned to USDA in 1971 where he worked on crop diversification, creating a database called the “Crop Diversification Matrix” with extensive biological, ecological and economic data on thousands of cultivated crops. His interest in medicinal plants never waned no matter what unrelated tasks government bureaucrats pushed his way. In 1977 he became Chief of the Medicinal Plant Laboratory at USDA’s Agricultural Research Service in Beltsville, Maryland, and then Chief of USDA’s Economic Botany Laboratory. At the time, USDA was under contract with the National Cancer Institute (NCI) to collect plant materials from all over the world for screening for anti-cancer activity. One NCI scientist with a vision to explore the plant world for potential anti-cancer compounds was the late Dr. Jonathan L. Hartwell (1906-1991). His pioneering work on the common mayapple (Podophyllum peltatum) resulted in the isolation of podophyllotoxin and several other compounds known as lignans, which eventually led to the development of drugs used in chemotherapy for the treatment of testicular cancer and small cell lung cancer. In July 1960, a contract was established with NCI for USDA to begin collections of plant materials for screening potential new anticancer compounds. Over the next twenty-years, about 35,000 species of higher (flowering) plants were screened for activity against cancer. About 3,000 of those demonstrated reproducible activity. A small fraction of these (including mayapple and yew derivatives) were eventually chosen for clinical trials. Jim Duke supervised these collections in the later years of the program. On October 2, 1981, the Board of Scientific Counselors, Division of Cancer Treatment at NCI decided to abolish its plant-screening program — not enough new drugs came from the research. Later in the 1980s new automated laboratory technologies emerged, with better cell lines targeted toward human cancers resulting in the NCI reforming its natural products screening program. This time, however, collection contracts were given to major botanical institutions such as Missouri Botanical Garden and the New York Botanical Garden, rather than USDA. Jim Duke continued his work at USDA as Chief of the Germplasm Resources Laboratory, collecting data and plant material on food crops from around the world. He continued his association with the National Institutes of Health and the NCI working on potential anti-cancer and anti-AIDs drug leads. Later, from 1990-1992, he consulted with NCI’s Designer Food Program (to document plants with potential cancer-preventing activity) under the direction of the late Dr. Herb Pierson. During the Reagan Administration, he was also charged with the unenviable, and as Jim Duke himself admits, “impossible” task of finding a replacement crop in the Andes for coca, the ancient Inca stimulant and source of its abused alkaloid, cocaine. Duke not only continued his personal interest in medicinal plants — increasing his database to include over 80,000 plant species — but began a flurry of publication activity which continues unabashed. Works from this era include many of his important scholarly books such as the CRC Handbook of Medicinal Herbs, (CRC Press 1985), a standard technical reference, yet still a good read for the layperson. After more than 30 years of service, Dr. Duke retired from USDA in September of 1995. “Retirement” is hardly a word that applies in the traditional sense. It was more like a coming out party. 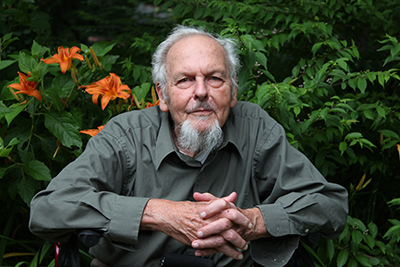 What retirement meant for the herb world was that Jim Duke could write what he wanted to write and say what he wanted to say—no more government sensors. Retirement for him, by fate not design, was the beginning of a new career as America’s herbal guru, tempered by a dose of Alabama charm. Ten years ago Dr. Duke lecture circuit included about 100 venues a and he led nearly 100 trips to the Amazon. He now spends most of his time at his rural farm in Maryland — Herbal Vineyard — with wife of many decades, Peggy Duke, a noted botanical illustrator and teacher in her own right. There you will find “the barefoot doctor” pulling weeds in his vast organic herb garden, perhaps the largest private medicinal herb garden in the country, with over 80 plots of plants arranged by disease condition, representing hundreds of species of medicinal herbs. Many of the databases he produced during his decades as USDA, such as Father Nature’s Farmacy, are available on-line at (http://www.ars-grin.gov/duke/). There, you will find a wealth of information on the phytochemistry, ethnobotany, and biological activities of thousands of medicinal plants. How do you write a story about someone you’ve known for 23 years [now for 36 years] who’s been profiled by everyone from People Magazine to the New York Times (and more than once in each) without sounding glib? When I started writing this profile, I decided to go through my Duke files. That search netted a pile of correspondence, articles by him or about nearly two feet tall. Sometimes having too much is worse than having too little! At a seemingly ageless 85 years young , Jim Duke is still in producing new books. 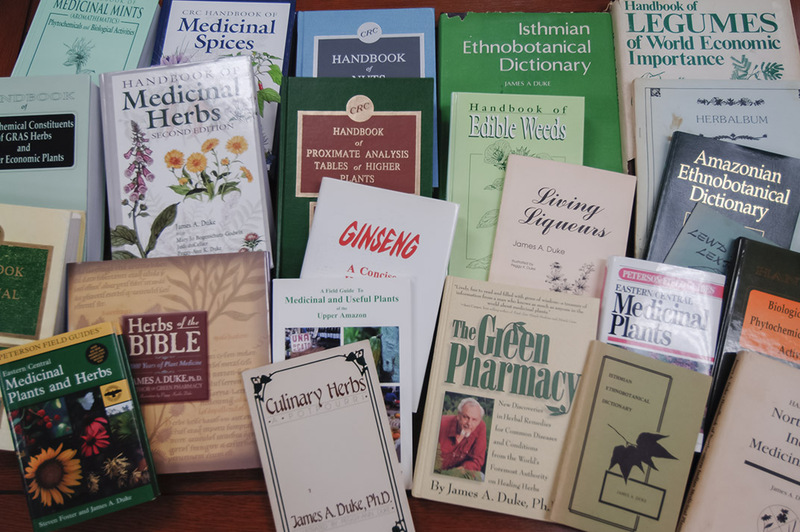 My library is arranged by subject; except for two authors — famed nineteenth century Cincinnati pharmacist, John Uri Lloyd and Dr. James A. Duke — both the only authors in the medicinal plant field prolific enough to warrant their own shelves. Duke has some catching up to do, though. My shelf of John Uri Lloyd books is three feet wide. My shelf of Jim Duke books is a mere two feet wide. I expect Jim Duke will make up the difference, and I hope one of the titles that fills that space will be a Jim Duke memoir [hasn’t happened yet]. Duke, J. A. 1985. Culinary Herbs: A Potpourri. New York: Conch Magazine, Ltd., Publishers. Duke, J. A. and E. S. Ayensu 1985. Medicinal Plants of China. Algonac, Michigan, Reference Publications, Inc.
Duke, J. A., A. Atchley, K. Ackerson and P. Duke. 1987. CRC Handbook of Agricultural Energy Potential for Developing Countries. 4 vols. Boca Raton, Florida: CRC Press, Inc.
Duke, J. A. 1992. Handbook of Phytochemical Constituents of GRAS Herbs and Other Economic Plants (and Database) Boca Raton, Florida: CRC Press, Inc.
Duke, J. A. 1992. Handbook of Biologically Active Phytochemicals and Their Activities (and Database). Boca Raton, Florida: CRC Press, Inc.
Duke, J. 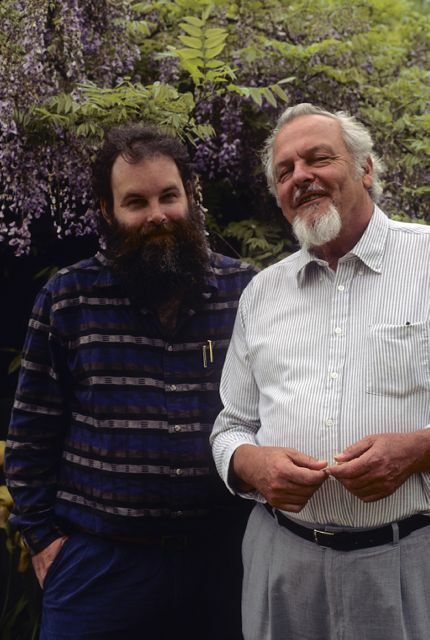 A. and J. L. duCellier 1993. CRC Handbook of Alternative Cash Crops. Boca Raton, Florida: CRC Press, Inc.
Duke, J. A. and R. Vasquez 1994. Amazonian Ethnobotanical Dictionary. Boca Raton, Florida: CRC Press, Inc.
Beckstrom-Sternberg, S.M. and J. A. Duke. 1996. CRC Handbook of Medicinal Mints (Aromathematic): Phtyochemical and Biological Activities. Boca Raton, Florida: CRC Press, Inc.
Duke, J.A. 1997. Green Pharmacy. Emmaus, Pennsylvania: Rodale Press. Castner, J. L., S. L. Timme, and J. A. Duke. 1998. A Field Guide to Medicinal and Useful Plants of the Upper Amazon. Gainesville, Florida: Feline Press. Foster, S. and J. A. Duke. 2000. A Field Guide to Medicinal Plants and Herbs. 2nd Ed. Boston: Houghton Mifflin Company. Duke, J. A. 2001 The Green Pharmacy Anti-aging Prescriptions – Herbs, Foods, and Natural Formulas to Keep you Young. Emmaus, Pennsylvania: Rodale Press.